We The People can create a plan for healthy livable cities. I urge all elected officials in all of the nineteen Contra Costa County cities to join me in this important pursuit. By providing unified leadership we can collectively influence far-reaching positive impacts for preserving our community for future generations. Global warming has impacts to our health, our water supply, our economy–our future. If we want to leave a legacy for our children, then we need to take climate protection seriously. Leaving a legacy for future generations to enjoy. Our network uses a three pronged multi-media approach that provides encouraging reminders and easy access to the tools necessary to ensure the county’s decision makers are well informed, educated and receive copies of best practices. We will strive to provide city leaders with a monthly newsletter, periodic workshops, and a website portal for sharing activities. This multi-media approach will ensure that best practices are at the forefront of day-to-day discussion–and that they are shared, supported, and implemented into policies that reduce Greenhouse gas emissions in Contra Costa County. For Up-to-date Information Join us on Facebook! 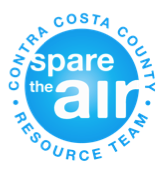 4CL is a Spare the Air Employer Program. Please Sign up Your City Today!